For detailed project information, visit the MassDOT GLX Project page. Slideshow: Hover to change images, or view all here. 1. This Page and City Alerts: The City of Somerville is committed to providing transparent, efficient, and comprehensive communication to residents throughout GLX construction. City-specific coverage will include information about construction updates and subsequent impacts that are most relevant to constituents, as well as announcements about upcoming related events and other resources, such as detour maps, as they become available. This page and City alerts are intended to supplement, not replace, broader outreach efforts from the GLX project team and the MBTA/MassDOT. We encourage you to sign up for those so that you’re fully in the know. 2. MassDOT / GLX Website: Visit greenlineextension.org, where you can find construction updates, progress photos, and full project background materials. The GLX project team developed a Community Working Group to enable information sharing between the project team and the public. The Working Group consists of representatives from each of the station areas in Medford, Somerville, and Cambridge. Working Group members provide assistance to the MBTA and to the community in identifying local issues of concern, facilitating dialogue, and planning agendas and topics for discussion at neighborhood and community meetings. We strongly encourage you to reach out to the Working Group representative closest to your area of interest and sign up for their alerts and updates. These representatives work very closely with the project team and the City of Somerville. They can provide you with valuable information for your specific neighborhood. The representatives for each area are listed below with their contact information. In bridge-closure news, the Medford St. bridge, behind the high school, will close Friday, May 17, until early spring of 2020. Although slightly earlier than anticipated, this timing will benefit both the GLX and the Somerville High School Building project. All traffic will be rerouted via Pearl St. and McGrath Highway. Review maps for all the detours here. The GLX project marked two construction milestones last week: First, the Homans building was demolished. Our neighbors at Above Summit captured demo day in this 30-second video, and the MBTA shared a satisfying clip of the final shove. Debris removal will continue throughout this week. Second, the Washington St. underpass has now been closed. Detours for all bridge closures are always here for your reference. Crews expect to use this week to prep for bridge demo. Catch the Somerville Bridge Hopper, the City's free shuttle around both the Broadway and Washington St. bridges, weekdays between 7 a.m. and 7 p.m. Head to the Bridge Closures & Detours tab to see stops and routes. If you have construction-related questions or concerns, please call the 24/7 GLX hotline at 1-855-GLX-INFO (459-4636), email [email protected], or contact 311. On Saturday and Sunday, April 6 and 7, as part of the Green Line Extension project, contractors will demolish the remainder of the Homans Building on Medford St. near the Pearl St. intersection. Work will be conducted between 7 a.m. and 7 p.m., though crews will be onsite at 6 a.m. to set up the work zone. During work hours, Medford St. between School and Walnut streets will close to motorists, cyclists, and pedestrians. Southbound motorists will be detoured via School St. and Highland Ave.
Northbound motorists will be detoured onto Walnut St. to Broadway to School St.
Access to abutting residences and businesses will be managed onsite by the construction supervisor during the street closure. MBTA bus route 80 will also service a slightly modified route in the area. The MBTA will post additional information on www.mbta.com and at affected bus stops. During demolition, excavators will carefully pull the building facade back toward the tracks and onto the recently cleared building foundation. Abutters should expect noise from heavy equipment, similar to that of the last few weeks. Dust will be controlled using a water mist. Starting Mon., April 8, around 10 p.m., the Washington St. bridge in East Somerville will close for approximately seven months as part of the next phase of the Green Line Extension Project. Free shuttle service will begin on Tue., April 9. During this phase of the GLX construction, all vehicles and pedestrians will be rerouted, and the 86, 91 and CT2 buses will be detoured. Please see the State’s website for detour maps and directions listed under the “Bridge Closures” section. The Somerville Bridge Hopper will run weekdays from 7 a.m. to 7 p.m., and will be operated by the City to help commuters get from one side of the bridge to the other. Signage will be posted at each designated shuttle stop to help direct commuters and pedestrians. The Broadway bridge is officially closed, and its deck has been successfully removed. Crews begin demolishing its concrete abutments Friday evening, March 29, and all day Saturday and Sunday, so noise is expected in the area. Cleanup and some excavation will continue overnight into early the morning of Monday, April 1. Catch the Somerville Bridge Hopper, the City's free shuttle, weekdays 7 a.m. to 7 p.m. It currently services two stops: one at Winchester St. and one outside Kelly's Diner. Signage is posted at each stop. Saturday and Sunday, April 6 and 7, during daytime hours, Medford St. between School St. and Walnut St. will close to all traffic while the remainder of the Homans building is demolished. Southbound traffic will be detoured via School St. and Highland Ave. Northbound traffic will be detoured onto Walnut St. to Broadway to School St. Onsite officials will manage access for abutters. The MBTA will post impacts to route 80 bus service onsite and online. The Washington St. bridge in East Somerville is expected to close for seven months starting Monday, April 8, at 10 p.m. Motor vehicles, bikes, pedestrians, and MBTA bus routes 86, 91, and CT2 will be detoured around that underpass. Review all routes here. Starting the evening of Friday, March 29, crews will begin to demolish the Broadway bridge’s concrete abutments. Demo is expected to continue Saturday and Sunday, 7 a.m. to 10 p.m. Noise from heavy construction and large machinery is expected. Cleanup and some excavation work will continue overnight, concluding early the morning of Monday, April 1. Work within the MBTA rail right-of-way is not subject to the City’s noise ordinance, but pile driving and demolition operations are contractually prohibited between 10 p.m. and 7 a.m. Unfortunately, overnight and weekend work will be required at the Broadway bridge over the coming year to take advantage of temporary Commuter Rail service outages. Contractors will minimize construction impacts as much as possible, but some disruption should be expected. We’ll continue to send notice to residents in the area prior to overnight operations. If you have questions or need assistance for a Green Line construction-related matter, please call the 24/7 GLX hotline at 1-855-GLX-INFO (459-4636), email [email protected], or contact 311. Westbound: Broadway at Winchester St. The yearlong Broadway bridge closure begins Friday, March 22, at about 10 p.m. All detour routes are on the Bridge Closures & Detours tab, or visit www.mass.gov/GLX. Bridge demo starts Saturday and Sunday, March 23 and 24, 7 a.m. to 10 p.m. Noise from jackhammering and other heavy machinery is expected. Cleanup will continue overnight. GLX Constructors will take advantage of planned Commuter Rail service outages to remove the bridge span over the course of one to two weekends. You may have noticed new flex posts in roadways around the Broadway bridge. These are one element of the City's traffic calming strategy during bridge closures. See the FAQs tab to learn more. Catch the Somerville Bridge Hopper, the City's free shuttle service, on Broadway starting Monday, March 25. Shuttles will run weekdays, 7 a.m. to 7 p.m., between stops on either side of the bridge: one at Winchester St. and one outside Kelly's Diner. Signage is posted at each stop. The Washington St. bridge in East Somerville is expected to close the evening of Sunday, April 7. Motor vehicles, bikes, pedestrians, and MBTA bus routes 86, 91, and CT2 will be detoured around that underpass. Review all routes on the Bridge Closures & Detours tab, or visit www.mass.gov/GLX. The year ahead will be challenging, especially for businesses in districts affected by construction. If you can, please stay #Loyal2Localand support them during bridge closures. Ready? The Broadway bridge closes Friday, March 22, for one year. If you drive, bike, walk, or take the MBTA 80 or 89 bus in that area, plan your new travel routes with these maps and this video. Take a look at the City's Broadway Bridge Closure Management Plan below to see all the steps we're taking to mitigate the impacts of this disruption. The Washington St. bridge in East Somerville is expected to close the evening of Sunday, April 7. Motor vehicles, bikes, pedestrians, and MBTA bus routes 86, 91, and CT2 will be detoured around that underpass. Review all routes here. The City will provide a free shuttle service to help residents navigate both the Broadway and Washington St. bridge closures. Routes are in final review, but service is expected to begin around the Broadway bridge the last week of March or the first week of April. Shuttles will run weekdays between 7 a.m. and 7 p.m. We'll provide more information as those details are finalized. On Monday, March 18, Homans building demolition will begin in earnest at the back of the site, proceeding incrementally over about three weeks. No major disruptions are expected until the facade on Medford St. comes down, likely the first weekend of April. As a reminder, if construction-related questions and concerns arise, please call the 24/7 GLX hotline at 1-855-GLX-INFO (459-4636), email [email protected], or contact 311. And don't forget -- when the bridges come down, our small businesses will need extra support. If you can, join the #Loyal2Local campaign and send some dollars their way. GLX Constructors’ demolition contractor is planning to mobilize and begin work on the Homans site, on Medford St. near the Pearl St. intersection, ‪on Wednesday, March 13.‬ The building will be taken down incrementally over a series of weeks. Initial work on the structure will begin in the rear of the building and is not expected to be impactful for abutters. The current estimate for the demo of the Medford St. face of the building is early April. Two weeks' notice: The Broadway bridge closes March 22 for one year. If you drive, bike, walk, or take the MBTA 80 or 89 bus in that area, please review these maps and directions and this video to get familiar with the new routes. The Washington St. bridge in East Somerville is expected to close in April. Motor vehicles, bikes, pedestrians, and MBTA bus routes 86, 91, and CT2 will be detoured around that underpass. All detour routes are outlined here. Please join City of Somerville elected officials and staff to talk through the Washington St. bridge closure, impacts, and mitigation efforts. We'll be at the East Somerville Community School (50 Cross St.) in the auditorium on Wednesday, March 13, starting at 6:30 p.m.
Building demolition on 3rd Ave. will continue during the week of February 25. Demo of one of the buildings there is complete. This will free up space for construction staging and, ultimately, a new vehicle maintenance facility. Next up to come down: the Homans building, likely in early March. Now let's talk bridge closures. The Broadway bridge between Ball Sq. and Magoun Sq. is planned to close starting Friday, March 22, for a full year. If you drive, bike, walk, or take the MBTA 80 or 89 bus in that area, these maps are for you. Here's a new video, as well, that outlines the diversions. Next, the Washington St. bridge in East Somerville will close in April. Motor vehicles, bikes, pedestrians, and MBTA bus routes 86, 91, and CT2 will be detoured around that underpass. Again, please reference these maps to prepare. We're hosting a public meeting to discuss the Washington St. bridge closure. Please join City of Somerville elected officials and staff to talk through impacts and mitigation efforts on Wednesday, March 13, in the East Somerville Community School auditorium at 6:30 p.m.
Demolition of two buildings on 3rd Ave. will continue for the next few weeks. This will free up space for construction staging and, ultimately, a new vehicle maintenance facility. The Homans building will come down next, likely in early or mid-March. In about six weeks, the bridge closures are expected to begin. The Broadway bridge between Ball Sq. and Magoun Sq. will close first -- for a full year. The Washington St. bridge just east of McGrath Highway will close in April, and the Medford St. bridge behind the high school will close in May. Hopefully you're familiar with the detours that will be in place, but if not, maps are always here for you on the Bridge Closures & Detours tab. NEW this week: MBTA bus detour maps. During the yearlong Broadway bridge closure, service on routes 80 and 89 will be modified. When the Washington St. bridge closes, routes 86, 91, and CT2 will be slightly adjusted. Take a look on the Bridge Closures & Detours tab to see more. Demolition of two buildings on 3rd Ave. is expected to begin Monday, February 4. This will free up space for construction staging and, ultimately, a new vehicle maintenance facility. Foundation shafts for retaining and noise walls are being drilled in behind residences on Gilman St.
Next month, the bridge closures begin. Starting in late March, bridges on Broadway, then on Washington St., then on Medford St. will close for the rest of the year. See the Bridge Closures & Detours tab for more information. Within the roadway during the week of January 28, please expect parking restrictions as crews work on Medford St. between Walnut St. and Central St., on New Washington St., in Ball Sq. near the Broadway bridge, and near Rogers Foam. MassDOT's latest biweekly construction outlook is up. Take a look for the latest on drainage and noise-wall work. Demolition of two buildings on 3rd Ave. has been rescheduled for a later date. More to come as that timeline firms up. Bridge closures are still expected to begin in late March, first on Broadway, then on Washington St., then on Medford St. Head to the Bridge Closures & Detours tab to see traffic impacts. Demolition on 3rd Ave. is expected to begin later during the week of January 21. Two buildings will come down to make space for construction staging. Ultimately this will be the site of a new vehicle maintenance facility. Within the roadway, please expect parking restrictions as crews work on Medford St. between Walnut St. and Central St., on New Washington St., on Tufts St., in Ball Sq. near the Broadway bridge, and near Rogers Foam. Bridge closures are expected to begin in late March, first on Broadway, then on Washington St., then on Medford St. Head to the updated Bridge Closures & Detours tab to see traffic impacts for cars, cyclists, and pedestrians. During the week of January 14, GLX Constructors will continue removing metal wall sheeting near Gilman St. and working on drainage infrastructure within the rail right-of-way. See the latest summary of upcoming work on MassDOT's GLX website. Looking ahead this year, for much of 2019, bridges on Broadway, Washington St., and Medford St. will be closed at the same time. Head to the updated Bridge Closures & Detours tab to see traffic impacts for cars, cyclists, and pedestrians. Join the GLX team for an open-house style public meeting on Wednesday, January 30, in the East Somerville Community School cafeteria from 6 p.m. to 8 p.m. Learn more about station designs, the Community Path extension, and upcoming traffic detours. Go to the Upcoming Events tab for more information. Mark your calendars: The GLX team will be hosting a public meeting on Wednesday, January 30, in the East Somerville Community School cafeteria from 6 p.m. to 8 p.m. The meeting will be open house style: Attendees can speak with representatives about station designs, the Community Path extension, traffic detours, and more. During the week of January 7, within the road right-of-way, crews will be working between manholes near School St. pulling cables, but no traffic disruptions are expected. Here's the latest on building demolition: Demo on 3rd Ave. is now expected to move forward in mid- to late-January. The Homans building will likely come down in February, followed by the buildings in Ball Sq. at the Boston Ave. / Broadway intersection. Here's the latest on bridge closures: The Broadway Bridge is expected to close for a full year beginning on or around March 1. The underpass on Washington St. just east of McGrath Highway will close in April, and the Medford St. bridge behind Somerville High School will close in May. No work December 22 through December 25. December 26 through the end of the week, GLX Constructors may continue ongoing abatement at the Homans Building on Medford St. between Pearl St. and School St. and test-pitting near the Broadway Bridge. Within the rail right-of-way, drainage work will continue through the end of the month. As always, check the MassDOT biweekly construction outlook for a deeper dive. Building demo is expected to begin in mid- or late-January, first at 3rd Ave. and the Homans Building, then proceeding to the Broadway / Boston Ave. intersection in Ball Square. The Broadway Bridge is scheduled to close in March, and bridges on Washington St. and Medford St. will close shortly thereafter. During the week of December 17, GLX Constructors plans to continue abatement at the Homans Building, requiring lane shifts, parking restrictions, and closure of the sidewalk on Medford St. between Pearl St. and School St. Within the rail right-of-way, work continues on retaining walls, noise walls, and drainage. Bookmark the MassDOT biweekly construction outlookfor more details. According to latest estimates, two buildings on 3rd Ave. and the Homans Building on Medford St. will be demolished in mid-January. Demo at the Broadway / Boston Ave. intersection in Ball Square will follow, likely in early February. The Broadway Bridge is scheduled to close in mid-March, and bridges on Washington St. and Medford St. will close shortly thereafter. Beginning in January, buildings at three sites will be demolished: First, on 3rd Ave., where a vehicle maintenance facility will go; next, the Homans Building, which will provide an off-road staging area during GLX construction; and then at the Broadway / Boston Ave. intersection, where the future Ball Sq. Green Line station will be. Demo at 3rd. Ave. is expected to begin around the first week of January. Abatement there and at the Homans Building is already underway. Within the rail right-of-way, crews continue drainage installation work, as well as the construction of retaining walls, noise walls, and a separation barrier to protect workers from the commuter rail. See the MassDOT biweekly construction outlook for more details. Verizon has also been on the Broadway Bridge relocating conduit in advance of the bridge's demolition next year. They're expected to be finished there by the middle of the week. The Broadway Bridge, between Ball and Magoun squares, is now expected to close beginning in March 2019 for a full year. Bridges on Washington St. and Medford St. will also close for varying periods of time later in 2019. This updated timeline is a result of the design-build process: As the project's design progresses, construction timelines and sequencing may change. The new schedule for the Broadway Bridge closure will not affect timelines for the other 2019 bridge closures or the completion of the overall project. GLX Constructors will be working overnight tonight, Wednesday, October 24, and Thursday, October 25, within the MBTA rail right-of-way between the Medford St. / Pearl St. intersection and the Washington St. / Joy St. intersection. During these times, crews will primarily be placing crushed stone known as “ballast” on the tracks and tamping it down beneath the rails. You may hear noise from trucks and other heavy equipment, but the work shouldn’t be excessively loud. Bright lights will be used within the work zone. As a reminder, overnight work is also planned for this coming Friday, Saturday, and Sunday nights, October 26 to 28, between the Lowell St. and Washington St. bridges. Construction activities will include track grinding and leveling, heavy-equipment hauling, and pouring and spreading more ballast. These operations will include bright lights and can be noisy at times. We apologize for the short notice about this schedule change. Working overnight this Wednesday and Thursday will allow GLX Constructors to finish the overnight work this weekend more quickly. Daytime work will continue seven days per week. If you have questions or concerns, please email [email protected], or call 1-855-GLX-INFO (459-4636). For the next two weekends, including the weekends of October 19 and October 26, overnight work is planned for Friday, Saturday, and Sunday nights between the Lowell Street and Washington Street bridges. GLX Constructors will be conducting track work and sporadic utility installation within the MBTA right-of-way, with most of the work taking place between Lowell St. and Central St. and near Washington St.
Construction activities will include track grinding and leveling, heavy-equipment hauling, and pouring and spreading of crushed stone. These operations will include bright lights and can be noisy at times. Daytime work will continue 7 days per week. Please note that the City’s normal weekend construction hours are Saturdays from 9 a.m. to 7 p.m., but work within the rail right-of-way is not subject to the City ordinance and is therefore legal to occur outside of our ordinance requirements. If you have questions or concerns, please email [email protected], or call 1-855-GLX-INFO (459-4636). The City's presentation from the August 29, 2018 information session regarding the one-year closure of the Broadway Bridge is now available online. On Saturday, August 25 and Sunday, August 26, between the hours of 7 a.m. and 9 p.m., GLX Constructors will be conduction demolition of an abandoned concrete pier adjacent to the Medford St. Bridge in Gilman Square, between Walnut St. and Pearl St. Because the work will require use of heavy demolition equipment like jackhammers and rammers, the work is expected to be loud in the immediate vicinity for at least the morning hours on Saturday. The work will be conducted in the rail right of way, and therefore no traffic impacts are expected. Please note that the City’s normal weekend construction hours are Saturdays from 9 a.m. to 7 p.m.; however, work within the rail right of way is not subject to the City ordinance and is therefore legal to occur outside of our ordinance requirements. On July 18, 2018, MassDOT held a public meeting at Medford City Hall to provide updates and information on the GLX project. On Saturday, August 4, GLX subcontractors will begin tree removals along the west/north side of the rail corridor, between Cross St. and Broadway. Work will be conducted on Saturdays and Sundays throughout the month of August and will progress from the south (Cross St.) to north (Broadway). Work will be conducted between 6 a.m. and approximately 6 p.m. on Saturdays and Sundays. Though the remainder of tree removals was originally scheduled to begin in early 2019, construction crews recently discovered that more tree work is necessary to facilitate construction of drainage systems along the rail right of way before more significant construction on retaining walls and building new tracks around the existing commuter rail line can begin. Due to the nature of the work, tree removals must begin earlier than anticipated. Additionally, following recent severe storms, a number of the remaining trees along the existing commuter rail line were heavily damaged and fell onto or near the tracks, creating hazardous situations. If you have questions about this work, please visit www.greenlineextension.org, email [email protected], or call 1-855-GLX-INFO (459-4636). While all dates and information are subject to change, current proposals by the GLX team call for the full closure of the Broadway Bridge at Ball Square, just east of Ball Square, for one full year beginning in the fall of 2018. As it stands now, the closure would apply to all modes of transportation, including bicycles and pedestrians. Additional temporary bridge closures for varying periods are also planned for later constructions phases in 2019 and 2020. The GLX team proposed closing the Broadway Bridge for a year -- the longest of the closures outlined -- because they’ll be completely rebuilding that bridge. They also have to conduct demolition and construction around an active Commuter Rail line, which has implications for when their work can take place. Detour routes are still under review. City staff, Community Working Group members, MassDOT, MBTA, and GLX Constructors continue to discuss the proposed closures at monthly Community Working Group meetings. Meeting presentations and minutes are posted at http://greenlineextension.eot.state.ma.us/CWG.html. Ultimately, detour routes will be produced for local traffic, regional traffic, cyclists, pedestrians, and MBTA buses. City representatives have been working closely with first responders, school officials, and local businesses to develop plans to accommodate restricted access to Ball Square. They’re also working to understand longer-term considerations for routine City services like trash pickup, street sweeping, and snow plowing, as well as how GLX work will interact with utility projects and other City construction. We will provide more information as it becomes available. The Homans building at 358 Medford Street in Gilman Square is scheduled for demolition this summer. Contractors are working closely with Somerville’s Historic Preservation Commission to ensure agreed-upon portions of the structure are preserved. Stay tuned for more information about a community-led event that will mark this new era for Gilman Square. In 2019 and 2020, a series of bridges along Somerville’s new Green Line route will close for GLX construction for varying lengths of time. While all schedules are subject to change, three closures are planned for 2019: on Broadway between Ball Square and Magoun Square; on Washington St. just east of McGrath Highway; and on Medford St. behind Somerville High School. As shown in the chart above, these three closures and their associated detours will be in effect simultaneously from the spring of 2019 through most of the year. Traffic Impacts: All cars, cyclists, pedestrians, and MBTA bus routes 80 and 89 will be detoured. From Powder House Rotary, continue onto Warner St.
From Broadway, turn left onto Cedar St. Turn right onto College Ave.
From Broadway, turn left onto Boston Ave. Turn right onto Harvard St. Turn right onto Winchester St.
From Broadway, turn right onto Winchester St. Turn left onto Harvard St. Turn left onto Boston Ave.
Traffic Impacts: All cars, cyclists, and pedestrians will be detoured. MBTA bus routes 86, 91, and CT2 will also be slightly modified. From Sullivan Square, proceed on Main St. to Mystic Ave. Turn left onto Lombardi St. Turn right onto Cross St. Turn left onto Tufts St.
From Washington St., turn right onto Tufts St. Turn left onto Pearl St. Turn right onto Tufts St.
Traffic Impacts: All cars, cyclists, and pedestrians will be detoured via Pearl St. and McGrath Highway. Take McGrath Highway to Pearl St. Turn right onto Medford St.
From Medford St., turn left onto Pearl St. This map shows regional traffic detours for the Broadway, Washington St., and Medford St. bridge closures. These are expected to be in effect simultaneously from the spring of 2019 through most of the year. How will the Green Line Extension benefit Somerville residents? The GLX project aims to increase mobility, encourage public transit usage, improve regional air quality, ensure a more equitable distribution of transit services, and support opportunities for sustainable development. All new stations will meet or exceed the Americans with Disabilities Act (ADA) standards. Who is involved in the Green Line Extension design and construction process? The GLX Project Management Team is made up of representatives from the Massachusetts Department of Transportation (MassDOT) and the Massachusetts Bay Transportation Authority (MBTA), as well as some external consultants. Green Line Extension Constructors (GLX-C) is the design-build contractor for the Green Line Extension project. GLX-C is a joint venture of four different engineering and construction firms: Fluor, Middlesex, Herzog, and Balfour Beatty. STV is GLX-C’s lead designer. The Community Working Group (CWG) is a group of community representatives from each of the new station areas in Somerville, Medford, and Cambridge. Community Working Group members provide valuable assistance to the MBTA and the community in identifying local issues of concern, facilitating productive dialogue, and planning agendas and topics for discussion at neighborhood and community meetings. The Cities of Somerville, Cambridge, and Medford work closely with all of the entities above. Where will the new Green Line service run? The GLX project will extend the existing MBTA Green Line 4.7 miles through Somerville and Medford. One branch (the Medford branch) will run along the Fitchburg commuter rail line and service new stations in East Somerville, Gilman Square, Magoun Square, Ball Square, and College Ave. in Medford. When will service along the Green Line Extension begin? The GLX is under contract to open for service in late 2021. The MBTA will conduct extensive testing prior to the full opening, so you may see and hear Green Line cars on the new tracks earlier in 2021, before it’s open to the public. Will the stations open as they’re completed or all at once? The stations, as well as the extended Community Path, will open all at once in late 2021. The MBTA will conduct extensive testing prior to the full opening, so you may see and hear Green Line cars running earlier in 2021, before it’s open to the public. Which of the existing Green Line trains (B, C, D, or E Line trains) will service the extension? The most recent plans have D trains running on the Medford branch and E trains running on the Union Square branch. Will the new Green Line service run underground? No. Service along the Green Line Extension will run above ground within existing commuter rail corridors, next to existing commuter rail tracks. Since these corridors operate within their own right-of-ways, service along the Green Line Extension won’t have to contend with stop lights or other traffic, comparable to service along the existing D branch. What time will the first trains depart from College Ave. and Union Square stations each day? Train schedules have not yet been determined. Those will be worked out closer to the end of construction. Will service on the new Green Line use new train cars? Yes. The GLX project contract included the procurement of 24 new Type 9 cars. Service along the extension will use these, as well as older Type 7 and 8 cars (though the MBTA hopes that these will eventually be phased out as more new cars are procured). What’s going on with the Community Path? As part of the GLX project, the existing Community Path will be extended from its current end at Lowell St. in Somerville to North Point Park, near the Museum of Science in Cambridge. The Community Path Extension will open with the Green Line Extension in late 2021. What should I know about bridge closures and detours? Throughout 2019 and 2020, a series of bridges around the City will be closed for construction for varying lengths of time. In 2019, bridges on Broadway, Washington St. (just east of McGrath Highway), and Medford St. (behind Somerville High School) will close, and all cars, pedestrians, and MBTA bus routes that typically travel those routes will be detoured. Go to the Bridge Closures & Detours tab for more information. Why will Broadway Bridge be closed for a whole year? There are a few factors informing the duration of the Broadway Bridge closure. GLX Constructors will be completely demolishing the bridge, as well as its concrete abutments, and widening the existing rail alignment to make room for the new Green Line tracks. Then they’ll construct a longer bridge, to cover all four tracks, with utility and drainage improvements, as well as new painted bike lanes. The existing bridge’s design does not allow for a multi-staged demolition and reconstruction. The continuous yearlong closure provides the safest, fastest, and most cost-effective way to complete this work. Why can’t MassDOT use the “Fast 14” rapid bridge-replacement method on the Broadway Bridge, like they did in 2011 on I-93? The “Fast 14” method used to replace bridges by MassDOT in the past replaced only the top decks of existing bridges with only minor repairs to the concrete work. More extensive work is required on the Broadway Bridge, and essentially all of its infrastructure needs to be replaced (e.g., structural foundations, under-track drainage, and extensive support-of-excavation). When will construction be going on during the day? Construction activity is expected within the rail right-of-way seven days a week. Most work should take place between 7 a.m. and 4 p.m., although daily schedules are subject to change. Yes. Since the majority of construction will happen within an active railroad right-of-way, completing work at night and on weekends, when rail traffic is light or has been suspended, is critical to completing the GLX project in a safe, timely, and cost-effective manner. 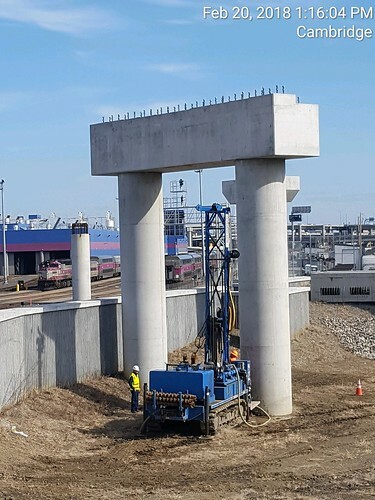 Work within the MBTA rail right-of-way does not fall under the City’s jurisdiction and is therefore not subject to the City’s noise ordinance; however, pile driving, drilling, and demolition operations are contractually prohibited between 10 p.m. and 7 a.m. The GLX Project Management Team will coordinate with the City to notify residents in affected areas 48 hours in advance of overnight work. Click here to ensure you’re enrolled to receive notifications from the City’s Alerts system. How will I be notified about overnight work? The City and the GLX Project Team will coordinate to notify abutters about 48 hours prior to overnight construction in your neighborhood. The City will send its notices to affected neighborhoods through the City Alerts system. Click here to make sure you’re enrolled to receive calls and emails in your preferred language. Is there a plan to deal with rodents during construction? Yes. As part of the GLX Constructors Pest Management Plan, A1 Exterminators placed nearly 500 baiting stations within the length of the right-of-way in the spring of 2018. Their service technicians are onsite at least one full day every week to monitor pest activity, conduct visual assessments, and address any areas of increased activity. Each of the 500 bait stations along the alignment is treated twice monthly. This abatement work will continue for the duration of the project. Whenever possible, A1 will use non-pesticide technologies, such as trapping and monitoring devices. If pesticides are used, A1 will use only U.S. EPA- and state-approved products and will select those that pose the lowest potential hazard to humans, domestic pets, and the environment. The City of Somerville also has its own rodent-control program to address pest management and prevention on multiple fronts. Click here to learn more about the initiative, including how to prevent rodent activity on your property and how to access free one-time abatement services. What’s up with the flex posts I’m seeing in Ball Square and East Somerville? In anticipation of increased traffic on neighborhood streets due to the closure of the Broadway and Washington St. bridges as part of the ongoing Green Line Extension project, the City has deployed flex posts as a quick and affordable method of traffic calming. These are intended to slow vehicles down, improve safety at crosswalks and intersections, and hopefully deter commuters from using these streets. How were these locations chosen? Streets that abut the official detour routes during the bridge closures have been prioritized. Of those streets, intersections that may be tempting cut-through routes for vehicles were highlighted as the best candidates for flex post treatments. Why are the posts placed where they are at each intersection? On two-way streets, posts are located on the centerline (whether it’s painted or not) to make the street feel narrower and keep vehicles from drifting into the other lane. Posts in the middle of the street are also generally set back about 20’ from the stop bar to allow bigger vehicles to make turns without running over the posts. Posts on the corners are intended to prevent vehicles from making right turns too quickly. On one-way streets, posts are located 11’ apart on either side of the travel lane and have the same goal of making the street feel narrower. Where feasible, the posts have been placed as close as possible to crosswalks to highlight these locations and slow vehicles where pedestrians are most likely to cross the street. What are the benefits of using flex posts for traffic calming? Flex posts are affordable, easy to install, and can be effective traffic calming tools if put in the correct location. While they may seemingly pose as obstacles for vehicles like garbage trucks and fire engines, these bigger vehicles can straddle the posts and run them over if needed without causing damage to the post or the vehicle. Snow plows prove a greater challenge, and many of the posts will either need to be removed for the winter or replaced in the spring. The City recognizes that this will happen and is working on a maintenance strategy if it is decided that these posts should stay out on the street as part of a longer-term traffic calming solution. Will there be additional work to accompany the posts? New 20-mph safety zones recently installed in Ball Square and East Somerville. Increased police patrols will prioritize enforcement. Supplemental pavement markings for traffic calming will be installed during the spring and summer. Traffic volumes and speeds will be monitored regularly and evaluated against baseline data for 15 locations in the region. The City is investigating installing planters and painting tan bump-outs at intersection corners to complement the flex posts. These are all affordable and easy-to-install traffic-calming methods that can be effective under a variety of circumstances. How will you know if they’re effective? Staff have already begun to monitor the effectiveness of the posts and will make adjustments as necessary. Speed studies will also be conducted in the coming weeks to find out if there is any effect on driver behavior. What should I do if I see a post that’s been knocked over or removed? Send a 311 request to the City to let us know if a post has been flattened or is no longer there. This is considered a pilot program, so at this time posts will not be immediately replaced and a maintenance strategy will be determined after evaluating how well the posts hold up at each location. After decades of advocacy, construction on the Green Line Extension is finally set to begin. The GLX project will extend the MBTA Green Line from a relocated Lechmere Station in East Cambridge to Union Square in Somerville and College Avenue in Medford. By the close of 2021, Somerville’s five new T stations will be up and running in Union Square, East Somerville, Gilman Square, Magoun Square, and Ball Square. Trains will operate every five to six minutes in the peak periods, providing fast and efficient service to downtown Boston. The Somerville Community Path will also be extended from Lowell Street to Inner Belt Road. The T extension is a key priority outlined in SomerVision, the City’s 20-year plan to make Somerville an exceptional place to live, work, play, and raise a family. Currently, 15% of the City’s population resides within half a mile, walking or biking, of a transit node. When the GLX is operational, that number will climb to 85%. We stand to see improvements not only to our infrastructure but to our collective health as a community -- physically, economically, socially, and environmentally. For Somerville, the fight for the Green Line Extension has been a fight for environmental justice and transportation equity. In 1990, Massachusetts agreed to extend the Green Line to offset the pollution increase within Somerville caused by the Big Dig. Despite this legal commitment, however, the Green Line Extension project lagged far behind schedule, prompting the City of Somerville and the Conservation Law Foundation to file a lawsuit to keep the project moving. In 2006, this litigation, with the help of community support and advocacy groups, finally brought about a multi-million dollar state investment in the Green Line extension from Lechmere Station into Somerville and Medford. Community involvement has played a large role in the initiation and planning of this project, and it will continue to be a priority as construction moves forward. The GLX Community Working Group, consisting of representatives from Somerville, Medford, and Cambridge, provides guidance and input to the Executive Office of Transportation and Public Works. STEP, the Somerville Transportation Equity Project, has also been involved throughout the process, ensuring that the extension will result in social equity, environmental health, and decreased population to improve the health of Somerville residents. Check back soon for more GLX events. Questions? Here’s who to contact. GLX 24/7 Hotline: The GLX team is the best first stop for any questions or concerns. Call the project hotline 24/7 at 1-855-GLX-INFO (459-4636) or email them at [email protected]. 311 Constituent Services: For basic City-specific issues related to the GLX, contact our 24/7 Constituent Services Office at 3-1-1 (or 617-666-3311).